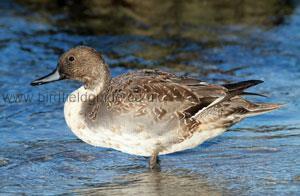 Note the very distinctive white flash on the side of the brown head of this male Pintail. Along with the long pointed tail this beautiful bird is unlikely to be confused with any other duck. 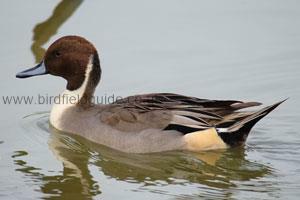 The Male Pintail is a largely grey bird with brown head, and hind-neck. The front of the throat is white and the neck has a distinctive white streak running up the sides. 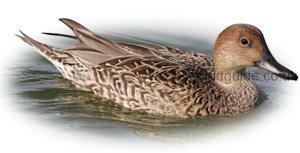 The Pintail is a large Mallard sized duck which feeds on the surface. Breeds mainly in the North and East of Europe. A very small number breed in the UK, around 20 pair, however in winter the Pintail is widespread with around 29,000 visitors from Northern Europe. Also known as the Northern Pintail the Pintail is one of the larger ducks, almost as big as a Mallard. The Pintail requires very specific breeding habitat: grassland with freshwater pools, hence the limited number breeding in the UK. In winter it can be found in small flocks on freshwater, flooded pasture and on estuaries, often where Wigeon can be found. The female Pintail like many female ducks is not so distinctive, the long tail and neck and large size are the best identification features. Mottled grey-brown body, pale belly. During the Summer the Male is more uniform in colour with the body and head mottled with grey-brown. This bird is an Autumn bird as the darker head is becoming pronounced and the grey flanks are becoming visible as he grows his brighter Winter plumage.